cortex of a mouse with a model of Alzheimer's Disease. 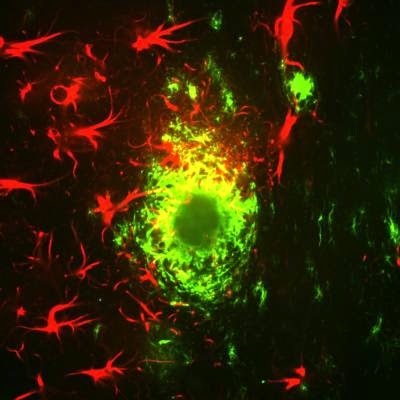 ﻿Memory, as well as connections between brain cells, were restored in mice with a model of Alzheimer's given an experimental cancer drug, researchers report in the journal Annals of Neurology. In the last five years, scientists have developed a more complete understanding of the complex chain of events that leads to Alzheimer's disease. The new drug blocks one of those molecular steps, activation of the enzyme FYN, which leads to the loss of synaptic connections between brain cells. Several other steps in the disease process have the potential to be targets for new drugs. Based on material originally posted by Yale University.